Step In With Micke discovering where are leading at our hot Girls. Sweden really produces constantly great bands. It's time for their third album and personally I was eagerly waiting. of keeping up the attention from the fans and the music world. I can say they have succeeded. Kiss & Tell is different then the other two. And it needed to be that. If they would have kept up the speed and the guitar mangeling, even how great it was, it would have sounded dated and definitely not fresh for Sahara Hotnights. They have told in interviews that when they went into the studio to work on this album after the long touring it just happened that they started making poppier songs. A contrast to the hardness and attitude that they had to bring out while touring for gaining respect. Always the double being a girl rock band. Now saying all this it doesn't mean Kiss & Tell is a pop album. It is still rock they are playing. But they have refined it to be more about the melodies and that the melodies needs to dictate the guitars than the other way around. 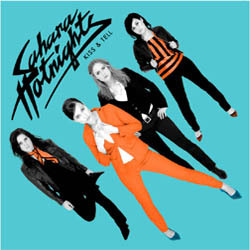 That it was said some months before the release of the album that this time they would be focusing mostly on the American market you instantly got a fear that they would turn out to Avril Lavigne copies but, I now understand that was just totally disrespectful to Sahara Hotnights. They have more integrity than that. Way more and they dictate their own demands. I can happily say their souls are still theirs and they have perfected them even more. The album kicks off, almost literally, with the pop explosion of Who Do You Dance For? And the title says it all. The album is produced by Peter Gunnerfeldt who has produced lots of Swedish bands before and still has the top spot of best produced Swedish album in Fireside's Elite. And you can hear he is perfect for Sahara Hotnights. It's a crystal clear production and the instruments comes out through a good pair of speakers very powerfully. And Maria's voice. What can you say? Well, I quote her: "I am surprised I haven't sung this great before, this is the way I talk so..."
Her voice has made as radical change as her looks. The band is incredibly tight as well. All the touring has done them even more so. And the harmonies and backing vocals has also been refined and gives an extra edge. All in all, everything is more and everything is better and clearer. After the power pop explosion it continues with the first single Hot Night Crash, keeps up with Empty Heart and Walk On The Wire. They are all great pop rock songs about broken love and longing. But it's when song number 5 starts, things gets really going. Mind Over Matter starts with a single guitar line and the drums and bass kicks in after a couple of seconds and the melody is fantastic. Maria's voice too. Of course. And it's now you slowly starts to understand this might turn out to be the greatest album they have made so far. And the best female rock band album, ever? We'll see. Stupid Tricks follows and is the biggest showcase of those harmonies I talked about earlier. And like Swedish bands are probably best in the world with; the songs are pop and happy sounding, but the lyrics are almost always melancholic. Nerves is the next one and by now you really can't stop listening with every sense of your body. It's rock as good as rock has ever been. The guitars on this one really stands out. And when Maria's voice cracks just before the last chorus you can only surrender. Stay/Stay Away follows and just keeps up the high speed that Sahara Hotnights has picked up by now. Keep Calling My Baby was one of the songs I took into the last, but now it's one of my favourites. You get a bit suprised at how open and honest Maria is in her lyrics on this album. You can feel the heart ache on this one. Incredibly touching. Difference Between Love And Hate is the second last one and is the best song they have ever written. Musically and lyrics wise without a doubt. It's just a rock song maybe, but I find no words to explain how incredibly much I love this song. After that burst of magnificence the last song, Hangin' has arrived. And now it's time for everyone to just show off, in a way. In a positive way that is. All is perfect and it's a perfect ending to a very impressive album. If this had been made by a rock band with guys it would be hailed as one of the best in the last couple of years. Now it sadly won't, but believe, it only says more about today's society than of the genious of this album. Review and words by Mikael Kustmark.